Makoto Kobayashi (小林 誠) is a Japanese artist and designer who has worked on many Japanese anime, notably those that involve mechas and things related to mechanical stuff. Some of the titles he has worked on includes Last Exile, Gundam, Steamboy and more. Hyperweapon 2014 is an artbook that features the projects that Makoto Kobayashi has been involved in. This includes Dragon's Heaven, Raison Du Vol, Space Battleship Yamato 2199, Space Battleship Yamato: Resurrection, Bye-Bye Gundam and other miscellaneous art and model kits created from 1979. The book for the most part features the concept art for all 26 episodes of Space Battleship Yamato 2199. The incredibly detailed artworks comprise mainly designs for space environment and structures. The designs are quite interesting. Their style of portraying advanced civilization and technology is the opposite of creating buildings with shiny surfaces, hard edges and streamlined modern look. The elements are more rounded, often with vein or root inspired textures. There's a very organic look and feel to the environment. Concept art for other projects come mainly in the form of 3D rendered models or just real life model kits. These are spread out in the book. The model kits look great. At times you can see some influence from another well known model designer Kow Yokoyama. In addition to mechas, there are also huge models of spaceships, space stations and cities. They are just as detailed as the pencil drawings. The mecha robots sport very cool worn out looks, some look like they have been rolled around in mud with those earth line cracks. Makoto Kobayashi works with other artists on creating these model kits. All the commentary are in Japanese, and whenever there are English words, it's not difficult to spot spelling errors. 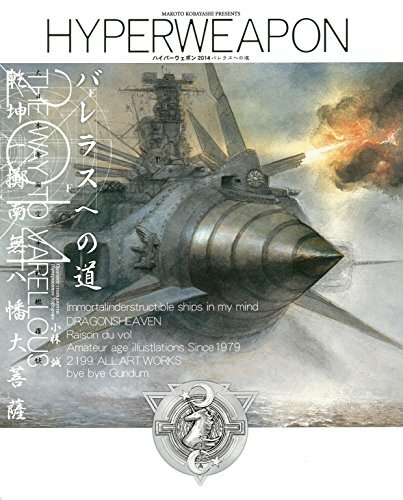 It's a good artbook for fans of Space Battleship Yamato 2199 and model kits.